This stuff is AMAZING! 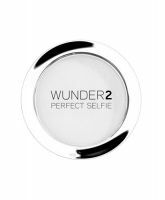 It's so fine and smooth -- sets my makeup without settling into fine lines or dry patches. It almost looks and feels like there is no powder on my face, yet my complexion is more even and smooth than before. My t-zone stays shine free. Only wish is that it came with a brush or sponge for touch-ups on the go. This stuff is SOLID. It's very finely milled, so it doesn't create a cakey appearance, and it definitely helped my makeup stay in place. It also added a nice imperfection-blurring filter to my face, which is always a plus.